Countertop Installation and replacement will really enhance your kitchen’s appearance and second to the cabinets your countertop is the most important and most visible item in the kitchen. Countertops take a beating on a regular basis so purchasing a good quality countertop with a professional installation is a must. Here at Kitchen Remodeler we will try to show the general guidelines to follow in order to select and install the right countertop for your new or existing kitchen. Most counter tops come in a form of one solid 45 S.F. - 60 S.F. of slab. Most kitchens require at least two slabs but anywhere from one for a very small size kitchen to four slabs for a more luxurious kitchen is common. You can either take a trip to your nearest slab yard or have your kitchen remodeler bring you samples from which you can choose. Right after the cabinets are installed a template is been made from your kitchen cabinet layout to insure the most accurate fabrication, after purchasing the selected slabs this template will be used to insure the perfect cut for your layout and most likely your new under mount sink. The countertop installation process needs to be extremely accurate. The fabricator will need to know the type of bull nose you desire and he will show you a chart of common finishes to your countertop edges. The countertop installation must occur on a solid and level surface and in most cases ½” plywood is being screwed on the surface of the cabinets. The countertop installers will deliver the fabricated slabs to the property and will perform final touch ups on site. A special adhesive is being applied on both surfaces and the new countertop is placed on the plywood. Naturally, wherever 2 slabs meet you can see a seam which will be covered by special caulking material. In order to reach perfection in the caulking color, your countertop installer must mix certain colors until the right shade is reached. Natural stone is porous which is why we always recommend applying sealer. This will prevent future oil and acid stains especially in bright stone colors. That’s the final step in your countertop remodeling project! 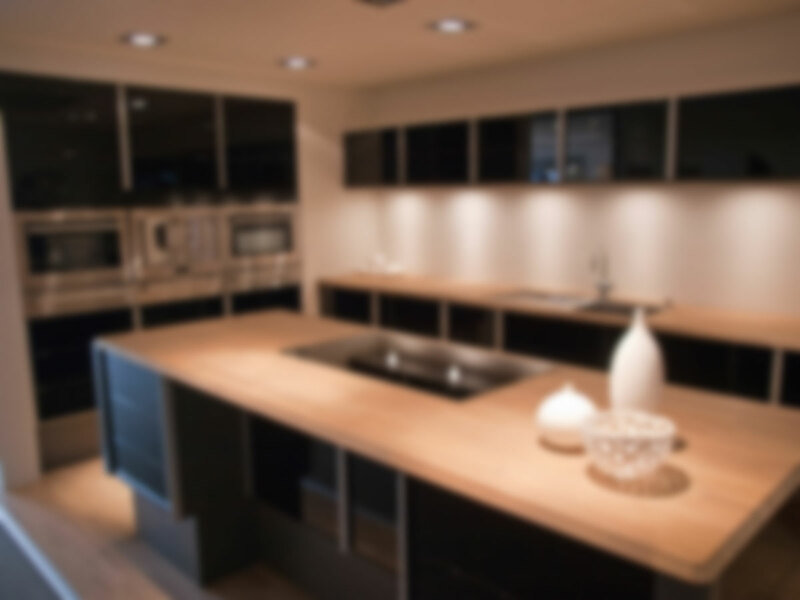 While searching for the perfect countertop installation in Los Angeles you most likely encounter the following types: Granite, Limestone, Marble, Corian, Casear Stone, SileStone, Glass and even concrete. These products tend to be the most popular types of materials for countertop installation, but each material has its pros and cons. Granite countertops are considered heavy duty and are generally resistant to heat and cutting, but can chip. This material is usually sealed after it’s fabricated because the material is porous. To maintain its life it’s recommended to seal the countertops on a regular basis. Limestone countertops are heat resistant, but not so resistant to nicks or scratches. It’s also very porous so it will easily become stained. It’s also more pricey when comparing with other types of countertops. Marble has long been used because of its elegant appearance, but it’s the least durable materials so you will have to be careful when dealing with it if you choose it for countertop installation. It’s susceptible to stains and etching so be sure not to spill any acidic liquids on it like vinegar or lemon juice. If you do, blot the liquid rather than rubbing it off. It’s not as heat resistant as granite which means it shouldn’t be placed near a grill or stove. This man made material is more expensive than granite. This material is easy to clean and it’s not affected by harsh household cleaners. It’s also great at resisting mold, mildew and bacteria. If you scratch this material you can buff it out pretty easily. The main disadvantage is that it’s not heat resistant and can scorch beyond repair pretty easily. Make sure to use hotpads or another protective measure before putting anything hot on top of the counters. This material is made of 93% natural quartz which makes it a very durable and strong material. It’s nonporous so it’s easy to clean with soap and water or a mild detergent. Unlike concrete, it won’t require a sealant. If you choose a honed finish you will need daily maintenance versus polished finishes. Silestone, quartz countertops, is one of the hardest materials available which makes it not easily damaged. It will resist cuts and scratches and unlike Corian it’s very resistant to heat. It’s still recommended to use hotpads and cutting boards though. It is on the pricier end and is generally more expensive than Casearstone. Like concrete, glass countertops are often used for modern kitchen designs. Using recycled glass is an eco-friendly approach to your countertop installation. It’s more heat resistant than Corian, but it’s still advised to use hot plates. It’s non-porous so it’s stain proof, but it can be scratched. The natural look is a slight green color, but translucent and opaque colors are possible. The glass countertop can be smooth, textured, etched, sandblasted, grooved or patterned. Concrete counter tops are often used in modern kitchen designs. You may not consider this material for your kitchen countertop installation, but it can be made with different pigments, textures and even decorative stones. Concrete counter tops need to be taken care of so they don’t wear and tear. This means clean it every day and seal it periodically. Juice, wine and oils can stain the concrete because it’s a porous material. Harsh abrasives like bleach or ammonia can damage the surface. Other materials include tile or laminate. Laminate is available in a lot of colors and patterns and are one of the most affordable materials. When it comes to countertop installation and remodeling you have many choices in material and styles. Ask your kitchen remodeler for tips or ideas on which way to go for your countertop installation. A good kitchen remodeling contractor knows the differences in materials and will be able to guide you in your decision should you need some assistance. First determine your needs and think of your favorite styles or colors to narrow your options. It will make your final choice easier to make! We are top rated kitchen remodelers and have been remodeling kitchens since 1997. We come with a lot of experience and knowledge when it relates to countertop installation, green kitchens, and cabinet remodels. You’ll be more than happy you chose us to be your kitchen remodeling contractors.